The diadem was brought to Poland by one of the Hungarian princesses. Later assigned to Konrad I of Masovia, Duke of Masovia it served as the personal crown of the Dukes of Masovia and was kept in the Płock Cathedral. In 1601 by order of King Sigismund III Vasa the diadem was placed by a goldsmith Stanisław Zemelka on reliquary of St. Sigismund (patron saint of the King, also kept in the Płock Cathedral). 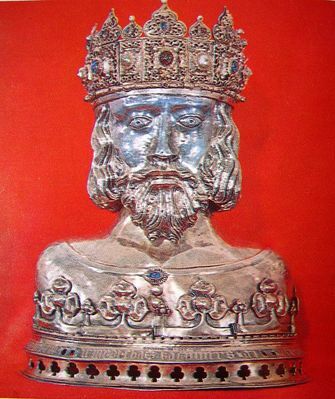 This reliquary takes the form of a bust and it was established by King Casimir III the Great in the 14th century to comprise relics of that saint. The reliquary was made in Kraków between 1351–1356 and it depicts the King. The reliquary was looted by the Germans during World War II, and later reclaimed. ^ a b c Grzegorz Traczewski (May 2008). "Parafia Katedralna św. Zygmunta w Płocku" (PDF). www.tp.com.pl (in Polish). Nasz krąg. p. 6. Retrieved 2009-05-04. ^ Na Hermie znajduje się diadem piastowski z XIII w., ozdobiony szafirami, rubinami i perłami. "Płock: uroczystości Zygmuntowskie ku czci patrona miasta". www.tp.com.pl (in Polish). KATOLICKA AGENCJA INFORMACYJNA. 2009-05-03. Retrieved 2009-05-04. ^ Najcenniejsza jest Herma św. Zygmunta ufundowana w 1370 roku przez króla Kazimierza Wielkiego. Blanka Stanuszkiewicz-Cegłowska. "Płockie skarby kapiące złotem i srebrem, wysadzane rubinami". www.tp.com.pl (in Polish). Retrieved 2009-05-04. Wikimedia Commons has media related to Płock Diadem. Sigismund I of Poland, of the Jagiellon dynasty, reigned as King of Poland and also as the Grand Duke of Lithuania from 1506 until 1548. Earlier, Sigismund had been invested as Duke of Silesia. A successful monarch and a great patron of arts, he established Polish suzerainty over Ducal Prussia and incorporated the duchy of Mazovia into the Polish state, securing the nation's wealth, culture and power. The Royal Sigismund Bell is the largest of the five bells hanging in the Sigismund Tower of the Wawel Cathedral in the Polish city of Kraków. It was cast in 1520 by Hans Behem and named after King Sigismund I of Poland, who commissioned it. The bell weighs almost 13 tonnes and requires 12 bell-ringers to swing it. It tolls on special occasions, mostly religious and national holidays, and is regarded as one of Poland's national symbols. The Royal Castle in Warsaw is a castle residency that formerly served throughout the centuries as the official residence of the Polish monarchs. It is located in the Castle Square, at the entrance to the Warsaw Old Town. The personal offices of the king and the administrative offices of the Royal Court of Poland were located there from the sixteenth century until the Partitions of Poland. Sigismund's Column, originally erected in 1644, is located in Castle Square, Warsaw, Poland and is one of Warsaw's most famous landmarks as well as the first secular monument in the form of a column in modern history. The column and statue commemorate King Sigismund III Vasa, who in 1596 had moved Poland's capital from Kraków to Warsaw. Siemowit IV, also known as Siemowit IV the Younger, was a Polish prince member of the House of Piast from the Masovian branch, from 1373/74 Duke of Rawa, and after the division of the paternal inheritance between him and his brother in 1381, ruler over Rawa, Płock, Sochaczew, Gostynin, Płońsk and Wizna, since 1386 hereditary Polish vassal, since 1388 ruler over Belz, during 1382–1401 he lost Wizna and during 1384–1399 and 1407–1411 he lost Zawkrze, during 1384–1399 he lost Płońsk, taken by the Teutonic Order. St. John's Archcathedral in Warsaw is a Roman Catholic church in Warsaw's Old Town. St. John's is one of three cathedrals in Warsaw, but the only one which is also an archcathedral. It is the mother church of the archdiocese of Warsaw. St. John's Archcathedral is one of Poland's national pantheons and stands immediately adjacent to Warsaw's Jesuit church. Along with the city, the church has been listed by UNESCO as of cultural significance. Płock Cathedral, or the Cathedral of the Blessed Virgin Mary of Masovia, in Płock, is a Roman Catholic cathedral in Poland, an example of Romanesque architecture. It is the oldest and most important historical monument in the city, which contains a number of tombs of Polish monarchs. Siemowit III of Masovia was a prince of Masovia and a co-regent of the lands of Warsaw, Czersk, Rawa, Gostynin and other parts of Masovia. The Royal Casket was a memorial created in 1800 by Izabela Czartoryska. The large wooden casket contained 73 precious relics that had once belonged to Polish royalty. The casket was inscribed: "Polish mementos assembled in 1800 by Izabela Czartoryska." It once reposed in the Temple of the Sibyl at Puławy. Stanisław of Masovia, was a Polish prince member of the House of Piast in the Masovian branch. He was a Duke of Czersk, Warsaw, Liw, Zakroczym and Nur during 1503-1524 jointly with his brother. Zawieszenie dzwonu Zygmunta is a painting by Jan Matejko finished in 1874. It depicts the installation of the Sigismund Bell in the Wawel Cathedral in Kraków in 1521. The bell was installed in the Sigismund Tower and rung for the first time on 13 July 1521. The bell is considered to be one of the national symbols of Poland. This painting is one of a number of historical paintings by Matejko. It shows a crowd of people, with a number of identifiable figures of historical importance. It conveys the Golden Era of the Polish Renaissance, and the power of the Kingdom of Poland. Alexander of Masovia was a Polish prince member of the House of Piast from the Masovian branch. He was Bishop of Trento since 1425, titular Patriarch of Aquileia since 1439, Cardinal nominated by Antipope Felix V as titular of the diocese of St. Lawrence at Damascus since 1440, titular Bishop of Chur since 1442 and rector at St. Stephen's Cathedral, Vienna since 1442, a diplomat.